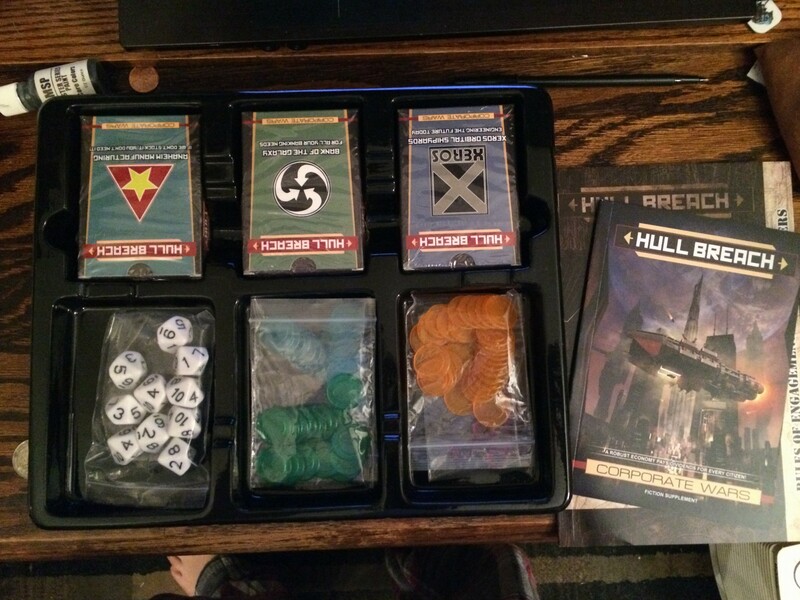 Home > Adventure, Card, Games, Reviews	> Hull Breach!!!! Sci-Fi Card Game Takes No Prisoners! Hull Breach!!!! Sci-Fi Card Game Takes No Prisoners! 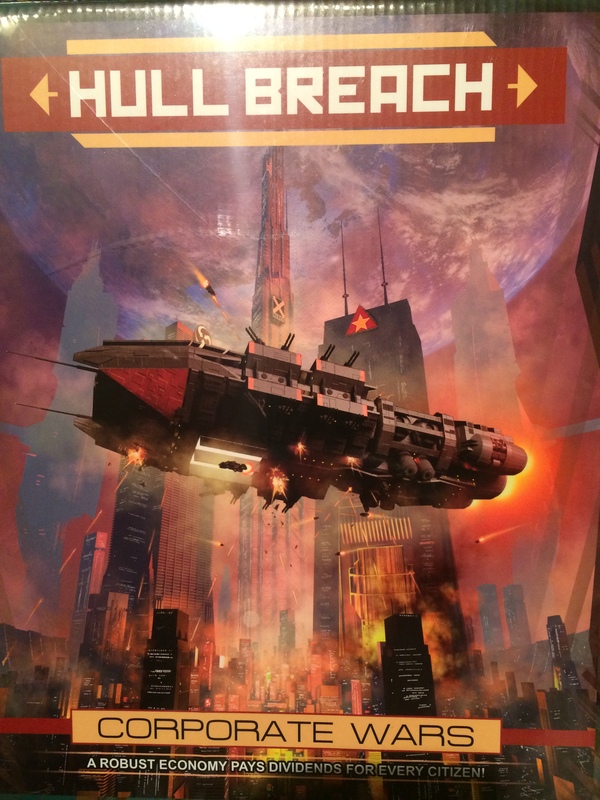 I went to SCARAB last week, and was able to play a round of the Living Card Game “Hull Breach” by NSB Games, Inc (‘Not So Broken‘ in case you were wondering). Grognard that I am, it took me a long time to get accept the idea of playing a card game, thinking that it bore too much proximity to Magic the Gathering for my taste. However, I’ve started to enjoy a number of what folks call “Living Card Games” which are not collectible. While expansions may be available in a living card game, they are fixed expansions with predetermined cards, and are available to anyone equally without the need to buy numerous ‘boosters’. I’m explaining this here because some people may not give a card game a chance for fear of that element of many games we are aware of. Hull Breach was run for me by a fun husband-wife team at SCARAB after showing up too late for my preregistered slot. I love picking up a new thing at a Con, as I mentioned months ago in my previous article, and the idea of things blowing up in space was too attractive to not try for my slot of dead time. Hull Breach did not disappoint. The Setting is rich, which is the game’s strongest asset. 25th Century, space is the new war ground of the corporations vying for dominance in interstellar trade. Xeros Orbital Shipyards, Anaheim Manufacturing, and Bank of the Galaxy are the three corps that come in “Corporate Wars”, a full game. The other box set, Loyalty and Vigilance, houses three additional factions, which I would summarize as the Brown Coats, the Imperial Navy, and the Galactic IRS. I’ll let you know what they are really called when I pick up that set, but that’s the long and short of it. The Cards in this game are well laid out, with everything available at a glance in a very intuitive way. Costs or assets are color coded with up and down arrows reflecting their cost or production value. A series of icons along the bottom of each card that are generally very uniform show you the firepower and armor of each unit, along with the unit’s carrying capacity if it is capable of housing marines, ships or drones. Game play begins with a setting up phase where each faction builds their space station and defenses. Each faction manufactures resources at differing rates, and station additions can add to that total. Initial ships are deployed and minimal defenses erected, and play begins. The strategy in Hull Breach is to build your forces up for an epic onslaught during the Engagement phase. Multiplayer games may differ, but in a two player game, it would seem that throwing everything at the enemy is a fairly sound strategy as combat continues until one side or the other is defeated or withdraws. In a multi-player game, leaving some ships at home becomes a bit more of a necessity, as the other players can take advantage of your recent struggles to set upon your unprotected base. 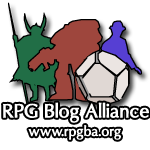 Combat, once engaged, is resolved by rolling multiple d10’s with a target number based on the defender’s armor rating, plus any special abilities. After a successful assault, enemy ships can be boarded for marine v. marine combat, and the ship commandeered. That occupied ship has the potential to revert back to enemy hands if you are foolish enough to remove your garrison (or if it is unfortunate enough to be killed in the line of duty). The end result of the boarding action, however, is a snowball effect as ships turn to your side in the war against the enemy faction. I had a lot of fun with Hull Breach, and picked up a copy. The retail price tag is a little hefty at just over $35.00, but the production value is pretty high (see the photos of the interior). Each box comes with a book of short fiction, three decks of cards, 10d10, two bags of tokens, and a small well bound little rulebook. Game play is interesting, fast moving, and allows for enough strategy to make things fun without slowing down overall play. Many cards in the game allow you to search through your deck often, which certainly is fine, but eliminates some elements of luck of the draw, which may appeal to some and less to others, and can take time. If you’re unfamiliar with the game and the cards in your deck, it will require more time to play, but I think we finished our two player game in 20 minutes (with a win for me, by the way), so it was far from burdensome. Discovering it was one of the highlights of the convention, for me. Living Card games draw the most value from deck building, and NSB Games plans on supporting the game with additional expansions. While corporate cards are color coded to be separate from non-corporate cards, I would like to see additional expansions be unique to various factions to help to refine the flavor of that particular faction. In living card games like Fantasy Flight’s Netrunner, factions have to build from their own decks, but may use other cards on a limited basis through the use of influence, creating a very specific world feel and play style that is closely tied to the faction itself. Hull Breach, I feel, could benefit from the same time of restrictions, or perhaps by tying the advantage of each card to the faction playing it. I think think the author’s of the Hull Breach setting are proud of what they’ve put together, and they should be. as the factions really appealed to me. Building on that is the way to go as more products go forward. Hull Breach is a fun, fast, easy to play game that has great potential. Keep an eye on this one, and see if your FLGS can’t get you a copy. You’ll be glad you did. I am so glad you enjoyed the game, and appreciate you coming by to see us at SCARAB! We appreciate the feedback, and are always looking for ways to help improve the appeal and game play!